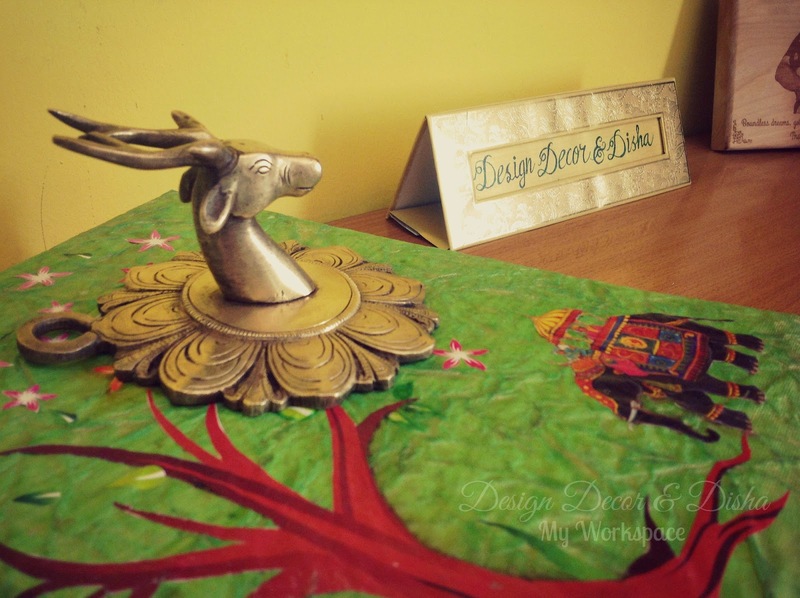 Today I will be showing you my workspace and telling you story how it came into existence. 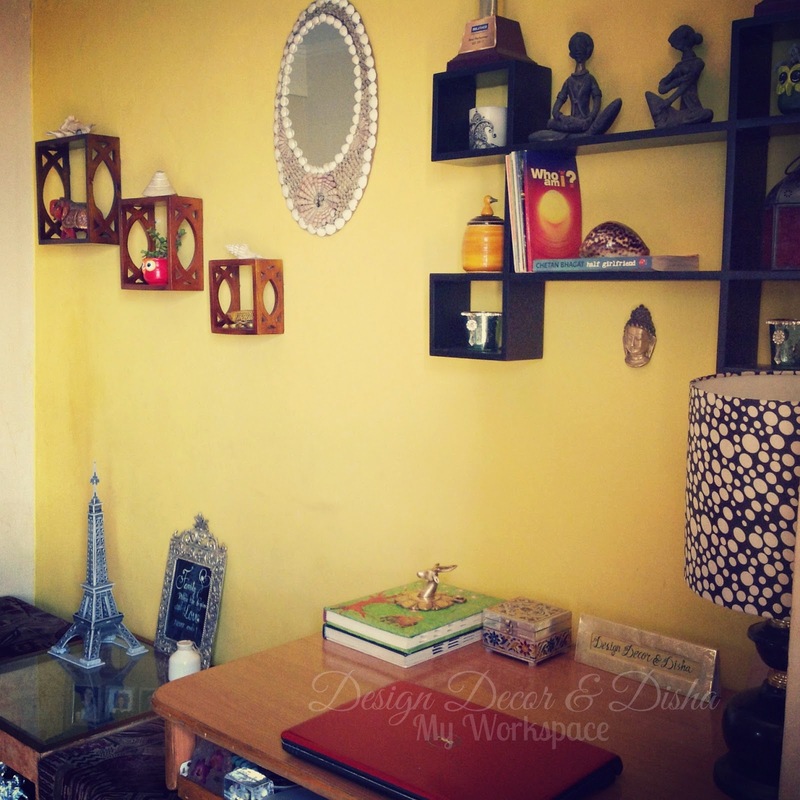 I have always wanted a place in my home dedicated to my creative work and blogging. I began my blogging career sitting on a sofa and for my creative work I worked wherever there was a space. But as my creative business and blogging started expanding, I needed a home office or workspace or you can call it a studio. 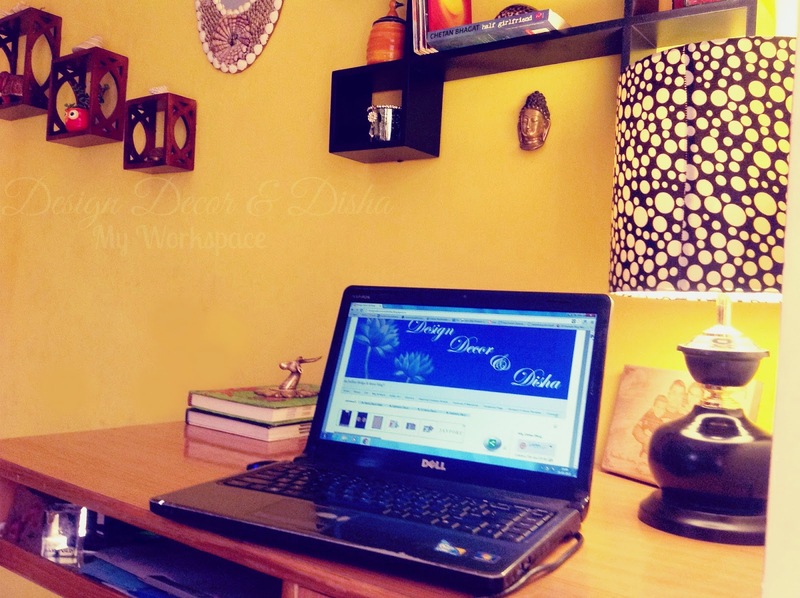 I believe that if you are working from home then it is very important to have a workspace to be focused and productive. I have been wanting to create my workspace since long. 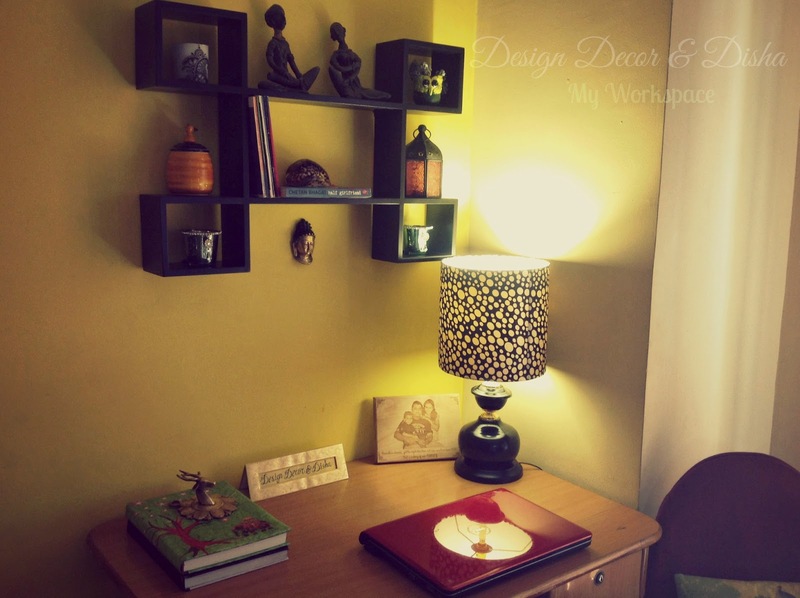 My husband gave me that much-needed push and suggested me to create my own workspace in an alcove in my living room. So I was ready to create a space that reflects who I am and what I want to be. I have a minimalist aesthetic, so I wanted clean edges and neat look for my workspace. I didn't want to get stuck with a particular style. I surround myself with the things I love, no matter if they are vintage, contemporary or kitsch. I love to mix things and put them together. Here is a before and after picutre of the place. The first step to create my workspace was to know what are the things that I already have and the things that I will need. I already had a desk, chair, art supplies, my artwork and some beautiful knick-knacks. Things that I needed were few storage units and wall unit to display my artwork, a table lamp for when there is no natural light and a key holder because all my keys were lying on my desk earlier and were giving it an ugly look. Now I was ready with a list of the stuff that I needed for my workspace. I love online shopping and I have always been selective about the online shopping portals from where I shop my stuff, so I did all the research and found out that Flipkart's home store section has the best collection of all home goods at best prices. 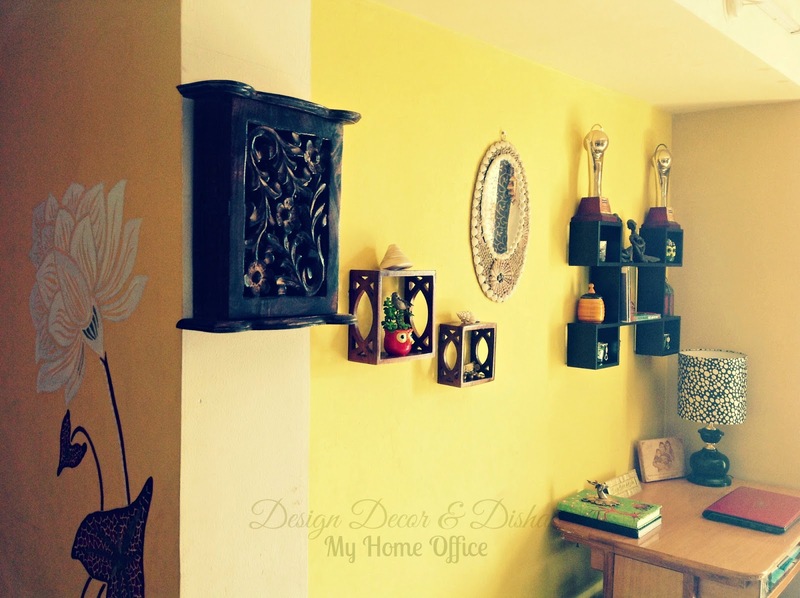 I browsed through different categories and then found a beautiful and very elegant looking wall shelf to display my artwork and knick-knacks to beautify my workspace. 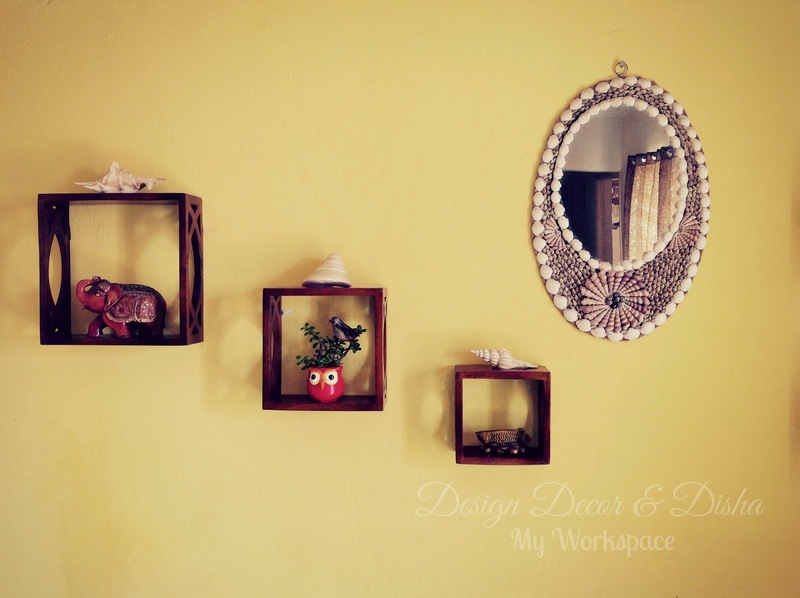 There were vast variety of wall shelves available on Flipkart. I was totally confused so I bought two wall shelves. When things are well organised, it really helps the creative juices flow. These wall shelves were a perfect addition to my home office. Up on the wall shelf are trophies won by my husband. These trophies not only make me proud wife every time I look at them but also boost my positive energy. Click here to check out all the discounted products on Flipkart. See all my stuff is so well organised and my workspace is emanating a lot of positivity. Some of my recent reads are on the shelf. Whenever I have some spare time in my hand, I read them again. With the onset of summers, there is beach theme going on in my home. Did you spot all the conchs and shells. Next I hunted for nice table lamp in Flipkart's home store section and found out the one that was a perfect fit for my workspace. They have a lovely collection of table lamps, floor lamps and wall sconces. I spent a lot of time gazing all the beautiful products there. I checked out dimensions of the table lamp that were given on Flipkart and it was exactly the same I wanted for my workspace. And see my decision was right. The lamp is looking beautiful on my desk. To be more organised, I thought of buying a key holder too. The moment I saw this beautifully carved wooden key holder on Flipkart's home store section I just wanted it. It has a vintage charm. Not only vintage, Flipkart has modern, classic and funky kind of key holders too. I just loved mine, it's going really well with everything else there in my workspace. Click here to check out collection of key holders on Flipkart. Added some personal touch to my home office with my handmade nameplate for my desk. I loved the overall look of my home office. It's full of positivity and warmth. For me, it is a little slice of heaven. All thanks to Flipkart for turning my dream into reality. Would be buying some more stuff from Flipkart for my son's room makeover.